(Phys.org)—A team of researchers at Karlsruhe Institute of Technology in Germany has developed a way to 3-D print objects made of pure glass. In their paper published in the journal Nature, the group describes their technique and the ways they believe their new approach could be used. Karl Ziemelis, Physical, Chemical and Earth Sciences editor for Nature offers a News & Views piece on the work done by the team in the same edition. Over the past several years 3-D printing has taken off as printers have improved and prices have fallen. Objects made by such printers have become common across the globe, from research institutes to hobbyist's garages. But despite its popularity, such printers have had one glaring weakness—an inability to print glass objects—3-D printers of today print objects made of plastics, ceramics and even metal, but not glass, which is a shame, the researchers note, because materials made of them offer many advantages such as resistance to thermal and chemical damage. And of course, they are transparent. 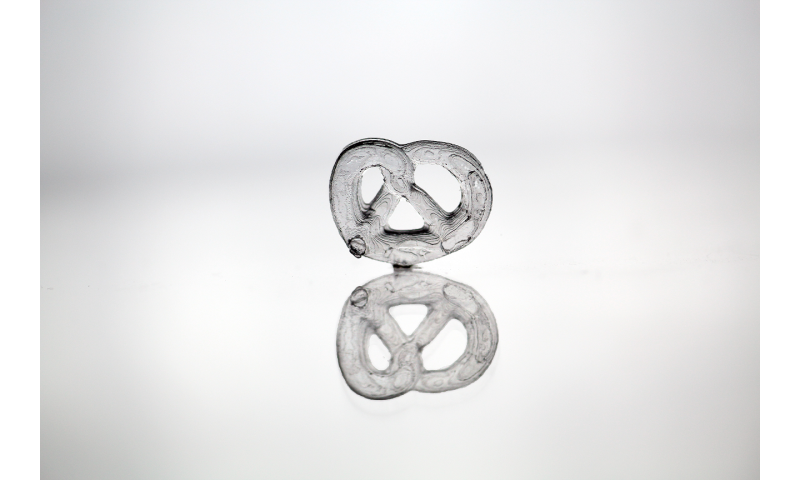 But now, it appears that has changed, as the team in Germany has found a way to print glass objects using ordinary 3-D printers. 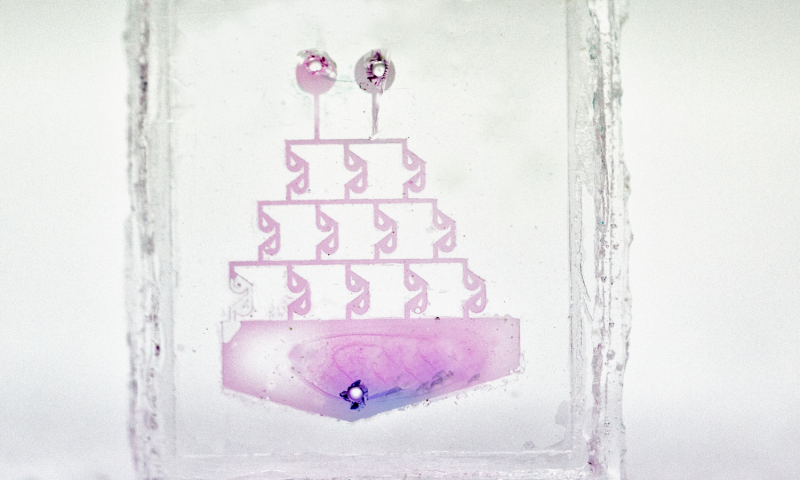 The new technique allows for 3-D printing glass objects based on the creation of a "liquid glass" the team developed—a glass nanocomposite with glass nanoparticles suspended in a photocurable prepolymer. In practice, the sandy glass nanoparticles are mixed into a liquid solution and the results are then used as the "ink" for the printer. 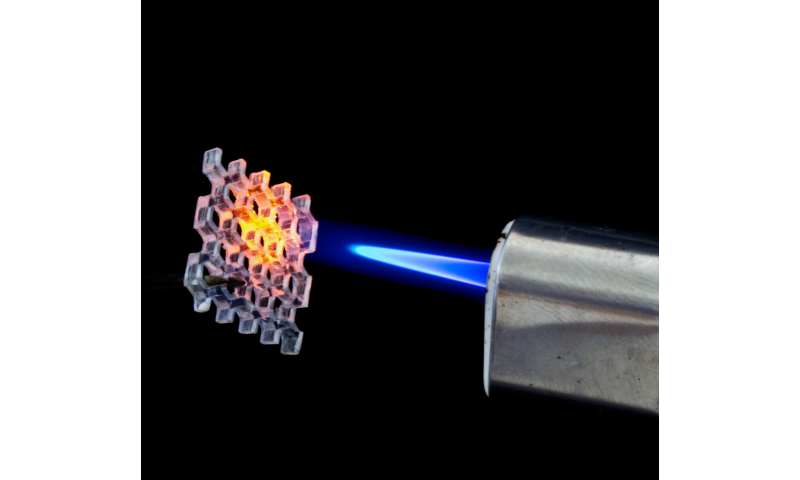 Once printed in the traditional way, the glass object is transferred to an oven that cures the glass and burns off other extraneous materials. The result is an object made of pure, clear glass. The researchers note that the size and precision of the objects printed are limited only by the precision of the printer used, just as with other 3-D printed objects. 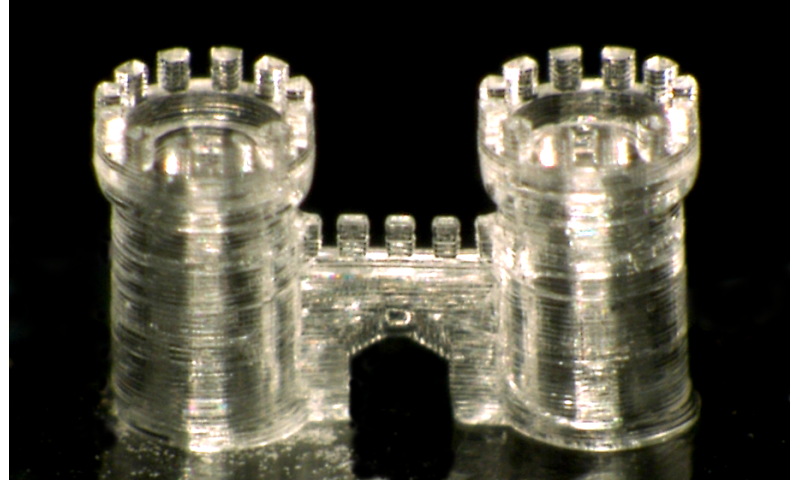 To demonstrate their new technique, the researchers printed tiny pretzels and an equally tiny castle and a honeycomb. They suggest the new technique could be used to produce both very large and very small glass objects, from skyscraper facades to tiny camera lenses. They note also that they believe that one day, most people will own a 3-D printer, and because of that, may choose to fashion their own glass objects, such as fine glassware or ornate windows. Glass is one of the most important high-performance materials used for scientific research, in industry and in society, mainly owing to its unmatched optical transparency, outstanding mechanical, chemical and thermal resistance as well as its thermal and electrical insulating properties. However, glasses and especially high-purity glasses such as fused silica glass are notoriously difficult to shape, requiring high-temperature melting and casting processes for macroscopic objects or hazardous chemicals for microscopic features. These drawbacks have made glasses inaccessible to modern manufacturing technologies such as three-dimensional printing (3D printing). Using a casting nanocomposite5, here we create transparent fused silica glass components using stereolithography 3D printers at resolutions of a few tens of micrometres. The process uses a photocurable silica nanocomposite that is 3D printed and converted to high-quality fused silica glass via heat treatment. The printed fused silica glass is non-porous, with the optical transparency of commercial fused silica glass, and has a smooth surface with a roughness of a few nanometres. By doping with metal salts, coloured glasses can be created. This work widens the choice of materials for 3D printing, enabling the creation of arbitrary macro- and microstructures in fused silica glass for many applications in both industry and academia.